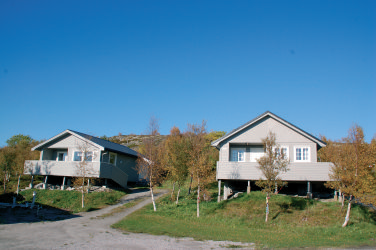 Prices Annual pitches: NOK 9000* Season Space May – September: NOK 7000* * + Power Consumption. One bedroom cabins near the sanitary building. This is an inexpensive and simple cabin for spending the night. Cabin with 1 bedroom. Kleiva Camping rents out 3 large cabins with bathroom and sleeping for 5-8 guests. The rental rates are based on how many bedrooms will be used. All cabins can be rented for use of one bedroom (i.e. 2 guests) or two bedrooms (3-5 guests), whereas Martha has 3 bedrooms (6 guests). Cabin with 2 bedrooms. Kleiva Camping rents out 3 large cabins with bathroom and sleeping for 5-8 guests. The rental rates are based on how many bedrooms will be used. All cabins can be rented for use of one bedroom (i.e. 2 guests) or two bedrooms (3-5 guests), whereas Martha has 3 bedrooms (6 guests). 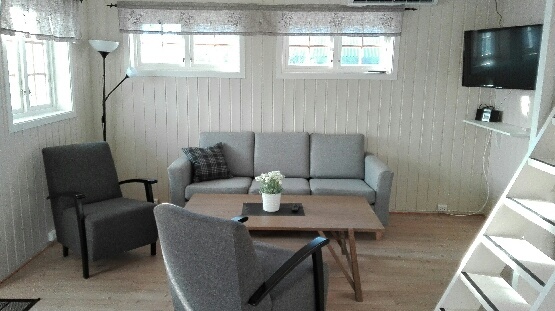 The cabin “Martha” has three bedrooms and sleeps 6 persons.